A Cristel Casteline stainless steel 8 inch non-stick fry pan with removable handle is an absolute must in any kitchen. These French-made frying pans are very easy to store because of their removable handles. The pans easily stack inside each other for very compact storage. They also take up less space in the dishwasher than frying pans with handles! Because of Cristel cookware's three layers of stainless steel with a two-layer aluminum core, each fry pan can quickly heat to the best temperature for searing. The Cristel pans quickly adjust to a lower temperature so you can thoroughly cook meats without burning them. Casteline cookware is the top of the line style from Cristel. These stainless steel frypans are induction compatible, have a lifetime warranty and are made in France. Please note, handles sold separately. Slightly curved edges make pouring easier and help to reduce drips! 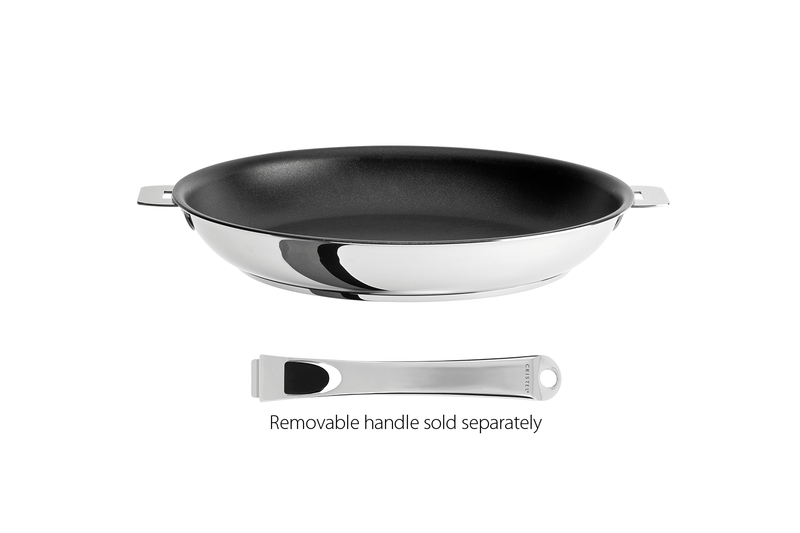 These French-made frying pans are very easy to store because of their removable handles. The pans easily stack inside each other for very compact storage. They also take up less space in the dishwasher than frying pans with handles! Lifetime guarantee from Cristel with normal use and proper care. Measures 8 inches in diameter and 1.5 inches in depth.